This tutorial introduces you to the basics of working with AWS Step Functions. To get started, you create a simple, independently running state machine using a Pass state. The Pass state represents a no-op (an instruction with no operation). Step Functions offers various predefined state machines as templates. Create your first state machine using the Hello World template. Sign in to the AWS Management Console and open the Step Functions console at https://console.aws.amazon.com/states/. On the Define state machine page select Templates and choose Hello world. Review the State machine definition and the visual workflow. Step Functions fills in the name of the state machine automatically. It also populates the Code pane with the Amazon States Language description of the state machine. This JSON text defines a Pass state named HelloWorld. For more information, see State Machine Structure. On the Helloworld page, choose New execution or, if you have started an execution before, choose Start execution. On the New execution page, choose Start execution. (Optional) In the Execution Details section, choose the Info tab to view the Execution Status and the Started and Closed timestamps. To view the results of your execution, choose the Output tab. You can update your state machine for future executions. State machine updates in Step Functions are eventually consistent. All executions within a few seconds will use the updated definition and roleArn. Executions started immediately after updating a state machine can use the previous state machine definition and roleArn. On the Helloworld page, choose Edit. In the Code pane on the Edit page, edit the Amazon States Language description of the state machine. Update the Result to read Hello World has been updated! (Optional) Select a new AWS Identity and Access Management (IAM) role from the IAM role for executions list. You can also choose Create new role to create an IAM role. For more information, see Creating IAM Roles for AWS Step Functions. Choose Save, and then choose Start execution. 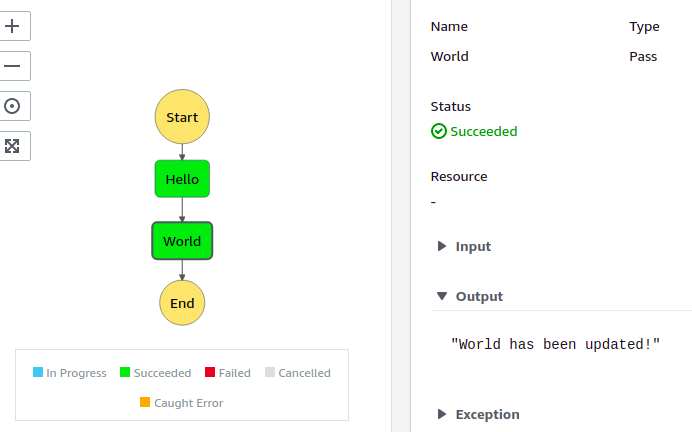 To view the results of your execution, select the HelloWorld state in the Visual workflow, and expand the Output section under Step details. The output text matches your newly updated state machine.